Mohamed’s Enterprise/New Era Entertainment fourth annual futsal tournament continued on Saturday night with four matches at the Mackenzie Sports Club (MSC) hard court in the Mining Town of Linden, as group action heats up with the teams’ eyes on the $500,000 grand cash prize. 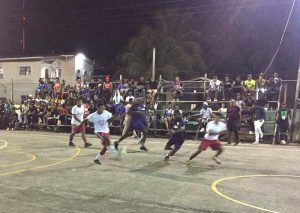 Action in the Mohamed’s Enterprise/New Era Entertainment tournament on Saturday night at the MSC hard court. In the first match on Saturday evening, NK Ballers got past Plantain All-Stars 4-1. Deon George scored two goals for the winners, while Joel Mackinnon and Paul Gittens assisted him with one goal each. Toyo Lewis scored the lone goal for the losers, All-Stars. In the second match, Colwyn Drakes netted a brace that allowed Swag Entertainment to edge Team Red Line 2-1 in their group match. Shemar Savoury netted the solitary goal for the losers, Red Line. The penultimate game proved to be the most exciting game of the weekend as fans witnessed seven goals being netted in a devastating one-sided match up that saw Spaniards steamrolled Royal Warriors 7-0. In that game, Raphael Edwards and national midfielder Curtez Kellman netted a brace each, while Kenneth Opara, Daren Benjamin and David Chanda both scored one goal respectively. The final game at the MSC hard court was a perfect climax to the night’s play as Young Kingz clipped Customs FC in a cliffhanger of a match that eventually finished 3-2. On the scoresheet for Kingz were Rondell Arthur, Denzil Pryce and Marvin Sullivan and scoring for the losers, Customs FC, were Frank Gordon and Stephen Roberts. The half-million dollar tournament resumes this tournament with quarterfinal action at the same MSC hard court venue. The first quarterfinal that gets underway at 18:30hrs will feature Customs FC taking on Silver Bullets for one of the four semifinal spots. NK Ballers will clash with Nutman All-stars in the second game, while Hard Knocks will go all out against Good Fellas in the third quarterfinal of the night. Swag and Good Fellas will be pitted to battle for the final semifinal spot in the feature game on Thursday night to go one step closer to the grand finale that will be contested on Boxing Night (December 26th). Additional exciting news from the tournament is the announcement of a Bakewell promotion that will see two lucky futsal patrons winning a Flat screen television and a Refrigerator on the day of the final. According to the organizers, for a chance to win the prizes, patrons must submit three Bakewell Tennis Rolls plastic bags with their name and telephone number in envelopes and submit them at participating stores. However, in order to win, participants must be present at the drawing on Boxing night, during the futsal finals at the MSC hard court.